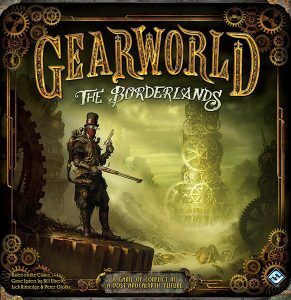 Gearworld: The Borderlands is the latest in Fantasy Flight’s series of resurrected “classics” of yesteryear — i.e., games you wish you’d heard of when they’d first been released, if you were even alive back then — and just may be the game of which I dreamed a paragraph ago. 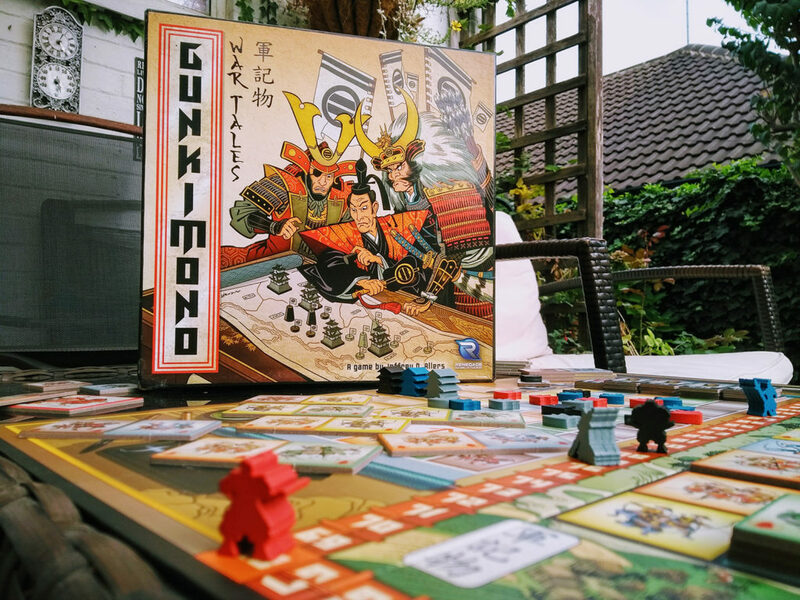 While the company bills it as “a game of conflict” (so as to differentiate it from the overwhelming flood tide of conflict-free games on the market these days), it is really a game of getting stuff where it needs to go before your opponents can do the same. There’s even a rulebook entry, taking up more than half a page, devoted entirely to Supply Routes. Think of it! 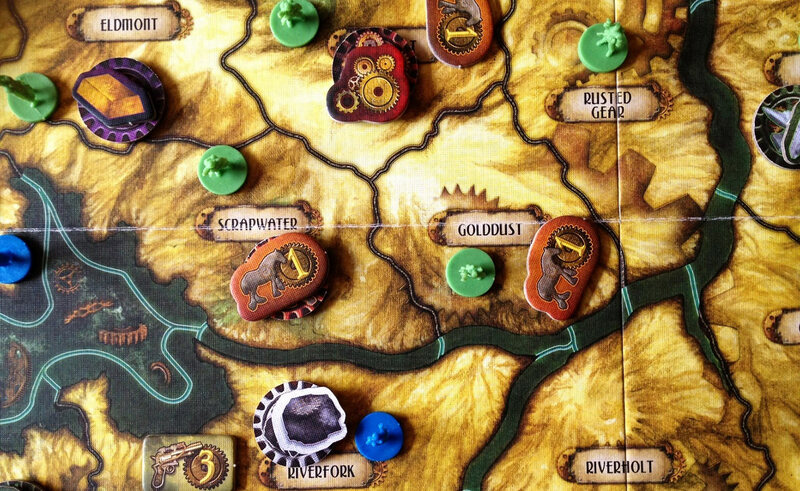 In play terms, what this boils down to is a game spent collecting oddly shaped resource counters representing things like coal, anvils and gears (or iron and scrap, as the rules have it), and using them to manufacture oddly shaped infrastructure counters like Bridges, Ships, the need-three-to-win Skyworks, and the colorfully named Weapons. And then, at least occasionally, using them to blow stuff up. Thing is, resource production is location-dependent. You may have an anvil mine in the Scrapwater territory, but your coal mine is down in Menlo Point, half a post-apocalyptic continent away. Coal plus anvil (or iron, rather) will build you a Weapon, but you’ve first got to get them to the same place. That’s where your supply routes come in. Or your opponents. Many will tell you that Gearworld is not about logistics, it’s about negotiation, ad hoc alliances, and, best of all, backstabbing. (Yes!) And they’d be right too. But it’s all that in the service of getting gears and anvils where they need to go. And then, if you feel like it, using them to blow stuff up. 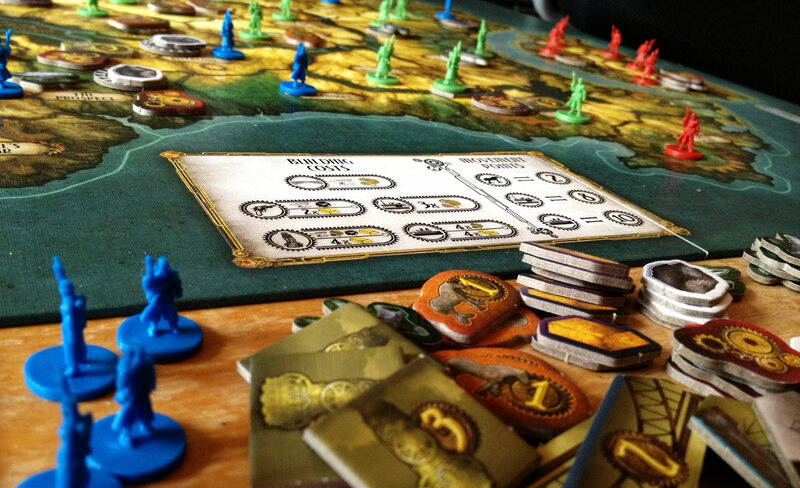 As in Settlers of Catan, an unlikely but distant cousin, trade can be crucial. And not just because you may find yourself with no gear-producing Scrapyards at all. The most common trade in Gearworld is like for like: a gold for a gold, a coal for a coal, etc. Because trade goods you receive can be placed in any territory you control. The trick here, of course, is convincing your neighbors that you’re going to add their anvil to the coal mine on the other side of the board, not the one that borders their territory with the Skyworks in it. If you can’t, you’ll need to build a Supply Route out of a string of oddly shaped horse counters, use Ships or Riverboats to get stuff around, or hurry it up overland, covering one painfully slow territory per turn — or sometimes not even that, if the dice go against you. While it’s the movement of resources around the board that makes the difference in the end, you’ll actually spend more time wrestling for control of lynchpin territories and eyeing your opponent’s riverboat to see that it’s not too close to your gold mine. Gearworld comes off at first as a simple randomless game of territory control. To take a neighboring territory (and any resource production that happens there), you just need to muster as many forces as the defender, in territories adjacent to your target. Both you and your opponent can ask any adjacent third parties to support your efforts, however, which is where the ad hoc alliances come in (as they do in Cosmic Encounter, SU&SD review here, another game originally designed in the 1980s by Bill Eberle, Jack Kittredge, and Peter Olotka, before being revived by Fantasy Flight). 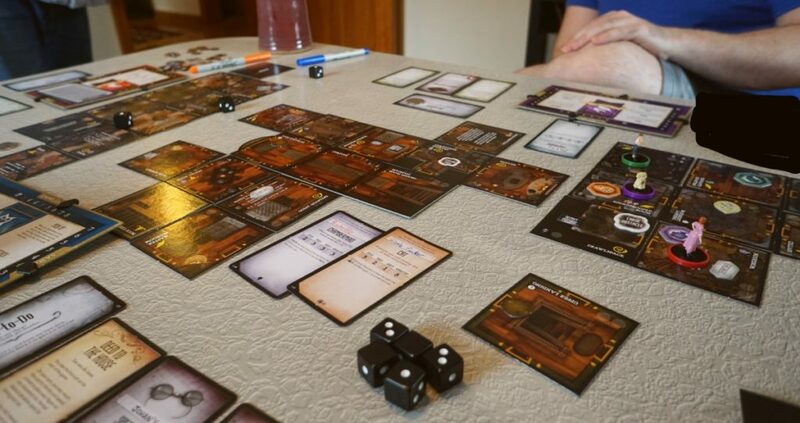 And while blowing stuff up isn’t a necessity — the win goes to the first player to control three Skyworks, whether built or captured — stuff will get blown up, mostly due to the simple but a bit brilliant mechanism that makes possible all the rest of the game: the set-up. 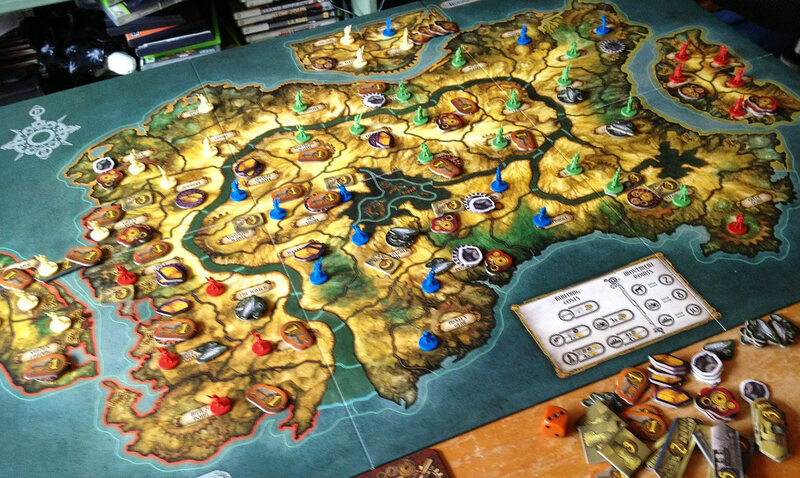 Simple: First, take turns randomly placing all those gold and anvil mines face down in various territories. There aren’t as many production centers as there are territories, so some areas will be empty. Then flip them face up, and take turns placing the plastic figures that represent your post-apocalyptic tribesmen in the territories you care to control. 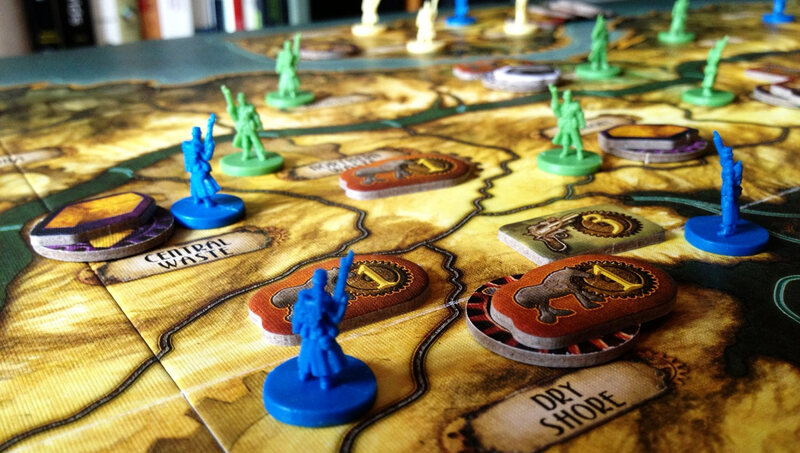 There are always more figures than territories, so everyone will have some left over with which to conquer more land. Brilliant? It sounds a bit trivial, doesn’t it? But because both logistics and combat depend heavily on occupying topologically advantageous nodes — or rather, awesomely positioned territories — and because the territories you like may or may not have the resources you need placed on them, the set-up phase lays a fairly deep foundation for the game to come. And it’s a foundation that rarely repeats itself. In one game, you may find yourself sitting on a set of mutually supporting territories which together provide most of the resources you’ll need, while in another you may find your little empire fractured, with only coal and gears to show for it, and maybe a horse farm and gold mine cut off from anything you might optimistically call a seat of power. These are two very different scenarios, both determined by the same endlessly variable set-up scheme. So, yes: brilliant. Where it gets really interesting is that if you’re light horses and anvils, then your fractured coal farms might just constitute the majority of the coal available on the board. And now you’re trading, you’re forming and breaking alliances, you’re denying the leader the sweet fruits of your post-apocalyptic labors, and you’re deep in the pleading, bullying, and cajoling that inevitably worms its way in. Now, in other words, you have a game. Not everything is airtight with Gearworld. 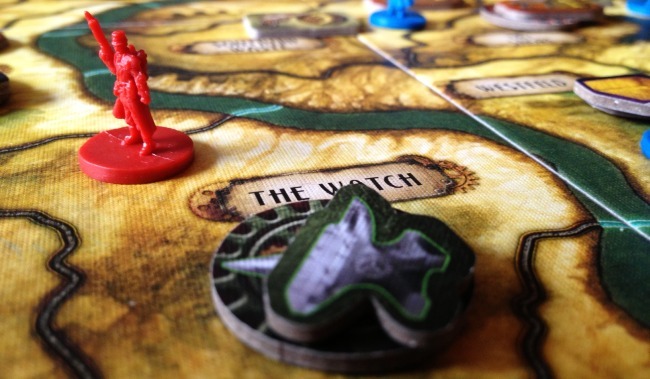 Those oddly shaped tokens sure do have odd shapes, and can be difficult to make out against the post-apocalyptic playing field, especially after a long night on the pear. And because of a vagary in horse farming (crucial to Supply Routes), it’s often hard to tell whether you’ve already produced a horse this turn or not. And in the game. Combat is satisfyingly diceless, and “Spearheading” — supporting attacks with remote forces brought into place via just-in-time logistics (yay!) — adds a layer of interestingness but also some opacity that isn’t aided by the writing style of the rules. A clear and helpful boardgame rulebook is of course an arcane art. 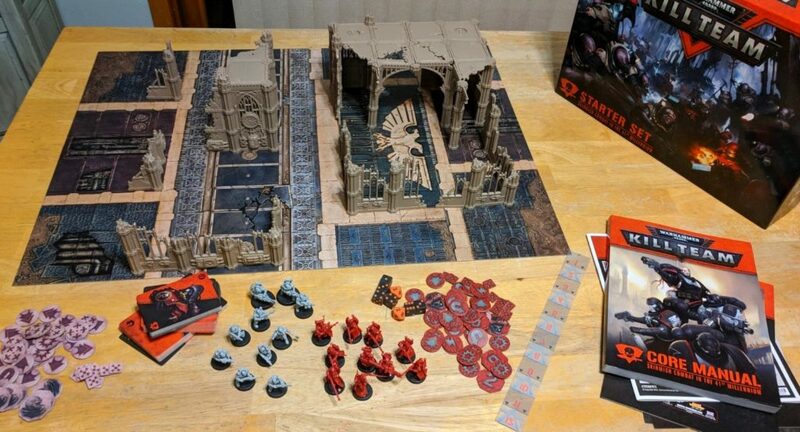 And while Fantasy Flight’s track record isn’t bad (especially considering the overdesign of many of their games), it seems they need to go back to art school for this one, which reaches a height of legalistic overexplanation matched only by some of the writing I’ve done for Shut Up & Sit Down. And did I mention the randomlessness? Well, I lied. It’s nearly so, but isn’t quite. Of the five phases in each round, three are “dynamic” — production, trade, and/or transport may or may not occur on a given turn, depending on the roll of a die. This can be irksome, especially when the die allows the active player to decide whether or not a phase goes off. But while it can provide a random advantage, it feels out of place in a game that’s otherwise tightly wrought. Better to do away with the mechanic altogether, or find a more meaningful way to work it in. Meaning, though, isn’t Gearworld’s strong suit. Victory comes from controlling 3 Skyworks (which also give advantages during play) so as to gain favor with the mysterious Sky People, who departed in flying cities to the World Above way back when “the gears still turned.” Though the tale of the noble steampunk savages that now inhabit the surface of the world could well be interesting in itself, the game’s tight mechanics just can’t handle all that freight. 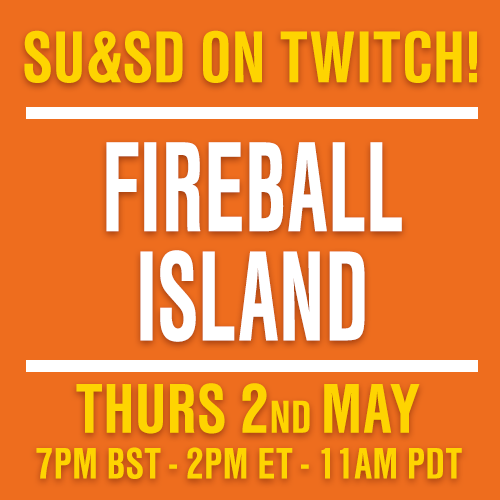 Catan makes sense: you’re settling an island, and you need the stuff to do it with. Gearworld could have found a simpler excuse — as the original Borderlands did in 1982: tribes of “the barbaric future” vie to found a new civilization by controlling three cities at the end of a turn. Perfect! Unless you’re Fantasy Flight, that is. 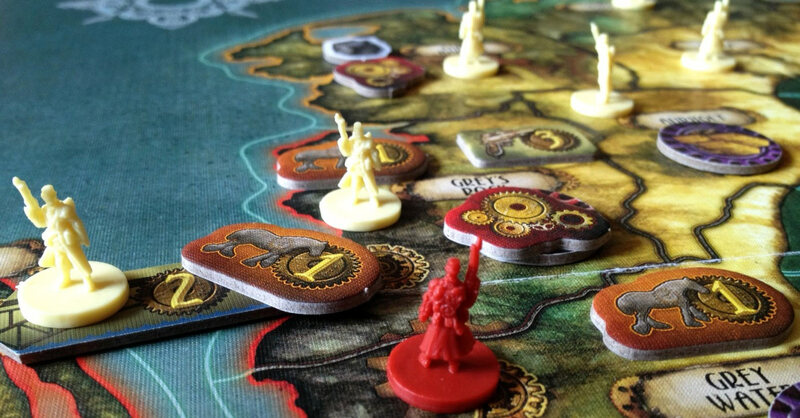 Despite its few rough spots, Gearworld is — for fans of strategy and diplomacy (whether with an upper-or lower-case D) — a game you want to own. The game can feel light, especially with fewer than four players (three-player games feel like they end just as things are getting interesting), but if you have the right group of strategists, and they don’t mind the occasional feel of cold steel between their post-apocalyptic shoulderblades, Gearworld could well prove playable until long after the gears stop turning.